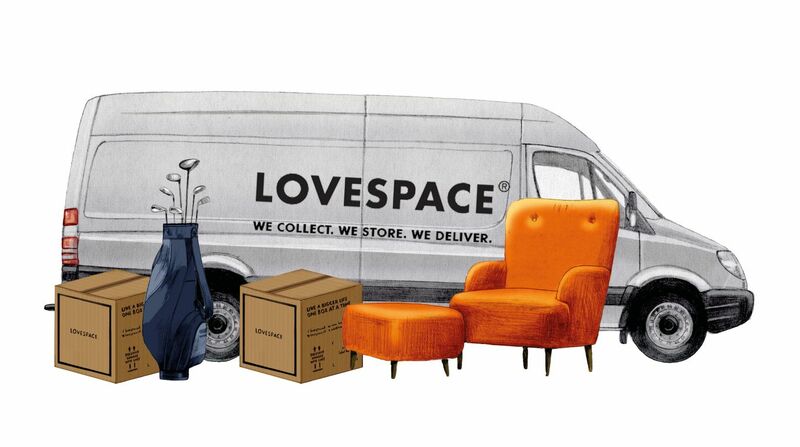 At LOVESPACE, we’re all about decluttering, enabling people to live a bigger life, that’s why we recently spent some time in the company of Simon and Jackie McLaren, Founders of Little Shop of Ltd. to find out more about what prompted them to start their business. Simon worked in the world of television with his own outside broadcast business before setting up Little Shop of Ltd with his wife of 33 years, Jackie, a garden designer, in 2010. The idea for these unique ‘Little Books’ came about after Jackie got so fed up with her jewellery getting tangled, broken or lost that she came up with her own idea for a solution to the problem. Simon asked a contact who made bags for television equipment to bring her concept, the ‘Little Book’ prototype, to life. The result was so effective that friends quickly began requesting their own and the idea for a business was born. Q: What made you decide to start Little Shop Of Ltd? We hear that it was your own clutter? Jackie: The mornings are undoubtedly one of the busiest times in any household and it frustrated me how much time I wasted searching for matching earrings or untangling a necklace. As a result, I was constantly looking for ways to declutter my dressing table to make it quick and easy to find essential items. Initially, Simon and I only made one Little Book of Earrings but it quickly occurred to me that if it was helping me keep on top of my clutter it could be helpful to others too. So the idea for our business, Little Shop Of Ltd, was born specialising in practical and stylish storage solutions for jewellery. Q: The bedroom seems to be most people’s problem room. Is that why you chose jewellery? Simon: By the time you’ve fitted in a bed, dressing table and cupboard, bedrooms can often be one of the smallest rooms in the house but the first to get messy. However, studies have shown that it’s much easier to fall asleep in a tidy room so it’s important to combat the clutter! It’s much easier to keep on top of your mess when you don’t have lots of small items, such as jewellery, to sift through. Our aim at Little Shop Of was to create a space efficient storage solution. 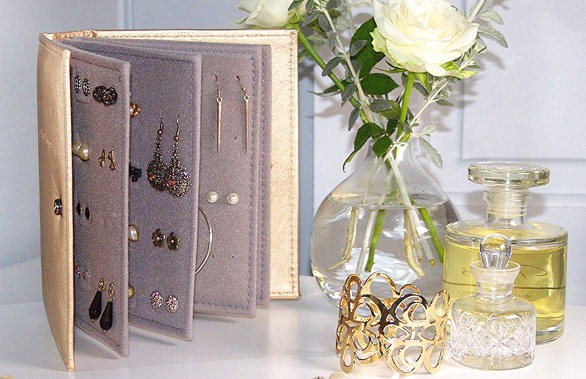 Our Little Books are much smaller than normal jewellery boxes but still hold a large amount (our Little Book of Earrings hold 48 pairs and the Little Book of Rings holds 27 rings) meaning you can have all your jewellery neatly stored on a dressing table or tucked away in a drawer. Although we currently only make storage items for jewellery, the same approach can be used to declutter all of your bedroom – if you know where to find it, then you know where to put it! Q: Given the selection of jewellery storage boxes available, were you confident that your products met a different need? Jackie: Absolutely! I spent years looking for an existing jewellery storage solution but found most jewellery boxes didn’t stop my accessories from getting tangled- I was just relocating the clutter, not sorting it out. Our hand crafted books are made using bespoke fabrics with soft padded pages to ensure jewellery is always well protected. Their unique design means accessories will never get tangled or tarnished and you can organise even your most expensive items discreetly whilst always having them close to hand. Q: Have you found that running your business has helped you keep on top of your own spring cleaning and stay clutter-free? Jackie: Different people find certain areas of their home harder to keep tidy than others. For me, never being able to find my jewellery drove me mad. I found once you have identified what your own problem areas are, it’s much easier to stay on top of the clutter. Shortly after setting up Little Shop Of, our mantra became, “a place for everything and everything in its place”. This not only applies to the business but also at home I find that if everything has a designated place it’s much easier to spring clean the house quickly and efficiently. Q: What has the research Little Shop Of recently carried out revealed about the nation’s attitude to mess? Simon: Little Shop Of recently surveyed 2,000 adults from across the UK about the effects of clutter to highlight the detrimental impact that an untidy home can have. The results were startling with almost 1/3 of the UK population feeling anxious and depressed by a cluttered and disorganised house. The controlling effects of clutter were further highlighted with 39% feeling de-motivated when their house is messy. It was disturbing to see that, not only does clutter make us feel bad in ourselves, but it also has a detrimental impact on how we are seen by others. 40% of the UK would be less likely to promote a messy colleague and 1 in 5 of us think friends with a cluttered home are lazy. It would seem it really does bother us when things are messy and untidy but we don’t place enough importance on sorting it out. As the survey revealed, our clutter culture is affecting every aspect of our lives so it’s time to take action!